When properly cleaned and maintained, a carpet goes a long way in trapping allergens and keeping them away from breathing zones. But if the carpet becomes too saturated with dirt and germs, these toxins can be released back into the air when unsettled by footsteps. The Carpet and Rug Institute (CRI) recommends that a carpet be professionally deep-cleaned at least every 12 to 18 months. With the absorbent-pad approach, a machine like a floor buffer applies absorbent spinning pads to the carpet to remove dirt. In the dry-extraction method, the carpet is saturated with an absorbent compound consisting of detergents and solvents and vacuumed up after the compound has absorbed the grime. 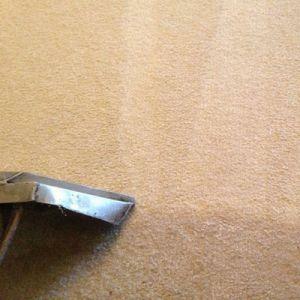 In the dry-foam cleaning method, a foam solution is applied to the carpet using a machine brush, then wet-vacuumed away. The final method involves steam cleaning, which applies chemical treatments and pressurized solutions into the carpet, followed by industrial-strength vacuuming. Before you and your cleaner agree on a specific cleaning method, check the manufacturer's guidelines for cleaning and warranty. The manufacturer may require a specific method to keep the warranty intact. Many warranties require that the carpet be cleaned at least annually. As with many other trades, the carpet cleaning industry includes some unreputable companies, so consumers need to be cautious in hiring for the first time. The Institute of Inspection, Cleaning and Restoration Certification, a nonprofit organization that sets standards and provides education and certification, warns that some carpet companies employ fraudulent tactics, such as bait-and-switch, amateur equipment and services and hard-sell tactics. Before hiring, search for carpet cleaners in your city and choose among those who have been given positive reviews from past customers. Interview prospective candidates in your home so that they can give you a more accurate estimate. Before work commences, have a contract drawn up that states the price of the entire job, including all fees upfront so that there are no surprises later on. Make sure that prospective companies are properly insured in the event that a laborer injures himself or damages your property. How long has the company been in business? Is the company IICRC certified? Does it use CRI Seal of Approval products? What are the basic service costs? How much do additional services cost? Do the cleaners offer a money-back guarantee? Do they have a truck-mounted hot water extraction system of at least 240° F? Ask the cleaners whether they move furniture during the cleaning process, as some companies consider this task too much of a liability issue.